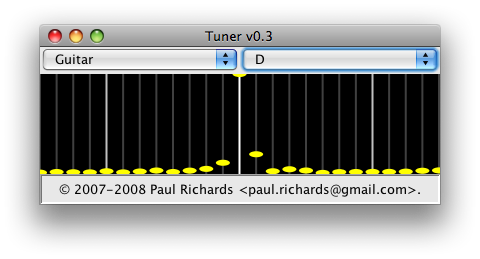 A small Java application for tuning string instruments. Use the left drop down list to select your instrument, then use the right drop down list to select the string you wish to tune. Play the note and watch the display. If the string is in tune then the yellow markers will form a spike centred on the middle white line. If the yellow markers form a spike that is too far to the left, then the string is currently tuned too low. If the yellow markers form a spike that is too far to the right, then the string is currently tuned too high. There are three white lines in total, the centre one is your target. Each white line denotes a semitone, and so the application can easily be used to tune to one semitone either side of the normal tuning. The grey lines are spaced at 1/8th of a semitone intervals. To tune other instruments and notes, edit the instruments.xml file.